It is one of the better upscale pizzeria out here in Vancouver and its not bad, other then the fact I find them a little over priced. My favorite is always the margherita. Simplistic, fresh, and tasty. In the picture, the massive burnt blister is their signature, as ive been told by others. Who knew burnt pizza was a thing? They provided rosemary and/or chilli flake oil to go with the pizza which really gave it the final touch for it. I don't know..the pizza should be complete but you need oil to complete it? The oil should only be the cherry on top, not the icing. The dough is rolled real thin, especially in the centre. Thin crust suppose to be a plus, right? However it can barely hold up the scarce amount of, I would hope is fresh or house made, tomato sauce. Let alone, holding up the toppings. And let me add one more thing, it won't be long till its soggy. Honestly I haven't tasted authentic Italian pizza, but I'm sure as hell feel that it isn't a super upscale thing. How upscale can pizza be? The feel from this restaurant is almost like there should be some weird wild and exotic ingredients that can not be found anywhere in the world but in a specific meadow on a island in the Bermuda triangle. 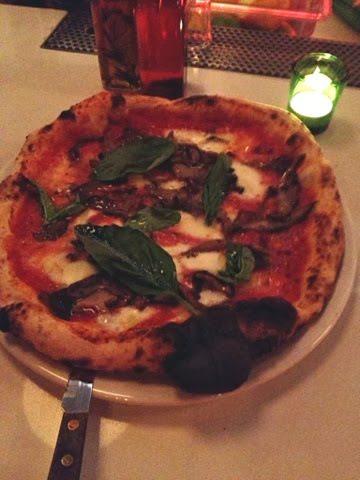 It's pretty good pizza, but its kind of expensive.